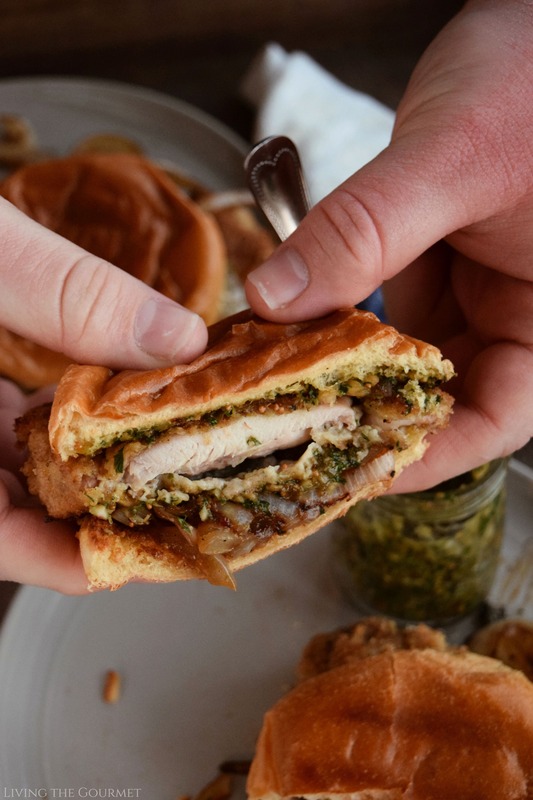 Crispy, oven-fried chicken cutlets are served up on a toasted bun alongside a refreshing cilantro and fig gremolata for the ultimate afternoon sandwich! Few things in life are said to make “everything” better. In fact, I can think of only three – bacon, butter, and fried chicken. Today, we’re focusing on that last one. In my previous post, I wrote about wanting to return to some ‘serious’ bites after a weeks’ long stint of home-style comfort, and today we’re continuing that theme of more ‘serious’ fare…sort of. 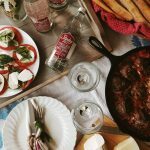 Imagine you’ve invited some friends over for a relaxed Friday evening, or to watch a game, or really anything less formal than a dinner party that involves food. Now, imagine that you want something to match the mood, something, something relaxed, something easy, but you still want to add on a ‘touch of gourmet,’ you want to both indulge your desire for a relaxed evening with your refined palate. 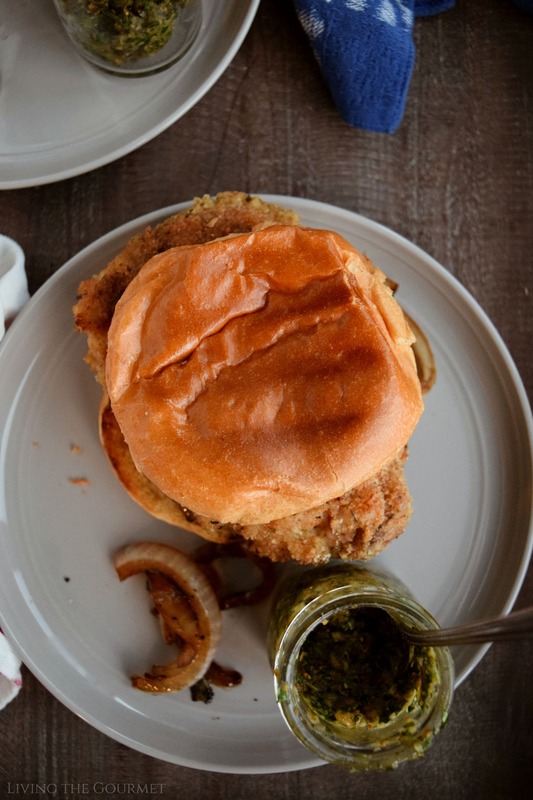 Naturally, that’s where today’s recipe comes in – Oven Fried Chicken Sandwiches with a Cilantro and Fig Gremolata and grilled onions. This is the perfect combination of fun and simplicity, with a dash of ‘gourmet’ thrown in for good measure. To start things off, we set up our kitchen space with a shallow bowl of breadcrumbs, one with an egg wash (read: briskly whisked eggs in a bowl), and a final bowl with flour. Once that’s set up, we dredge chicken thighs, de-skinned and de-boned, through the flour first, then the egg wash, and then the breadcrumbs. We then set the prepared thighs on a baking sheet, drizzle each with a bit of olive oil, and bake for about forty-five minutes. You want that classic fried chicken golden hue. You know the chicken is fully cooked once the juices run clear. Now, for the grilled onions. Begin by heating a large cast iron frying pan with olive oil, and add in a sliced sweet onion, and toss that to coat it with the olive oil. You want the onions to char slightly. Once that’s been achieved, add in sugar, salt, and toss again. Then add in a dash of balsamic vinegar, and toss a second time. Once the onions are soft, they are done. Finally, we come to the gremolata. Honestly, this part really couldn’t much easier. All you need to do is combine the ingredients listed below in the recipe card in a food processor, and give it a few pulses until you’ve reached your desired consistency. With all three components of the sandwich prepared, it is time to assemble the sandwich. I really doubt I need to walk you through this, but here we go. First, take a bun, toasted or untoasted, and…slice it in half. I know, this is some complex, groundbreaking stuff going on right now here at Living the Gourmet, but bear with me. Then place a fried chicken thigh on the bun, you’re going to want to watch your technique during this phase of the assembly, as you want the fried chicken thigh positioned optimally so as to maximize your sandwich enjoyment. The final steps of this sandwich assembly are somewhat controversial. Some suggest placing the onions next, others the gremolata. I have tried both ways, and I can confirm that the ‘optimal’ method of preparation is gremolata first. Finally, place the top of your bun on the sandwich, and you are done. Dredge the chicken first in the flour then the egg wash and finally in the breadcrumbs. Place on a baking sheet and drizzle each thigh with olive oil. Bake for 40 – 45 minutes for a nice golden outside. The juices must run clear for the chicken to be done. Combine all of the ingredients for the gremolata in a food processor and process to desired consistency. Taste to adjust any seasonings. For the grilled onions, heat a large cast iron frying pan with the olive oil. Add the sliced onion and toss to coat with the olive oil. Let the onion begin to char. Add the sugar, salt, brown sugar and toss. Finally, add the balsamic vinegar and again toss. Allow the onion to become nice and softened. Place the chicken on one side of the bun. Place the gremolata on the chicken, top with the onions and close with the other side of the bun. 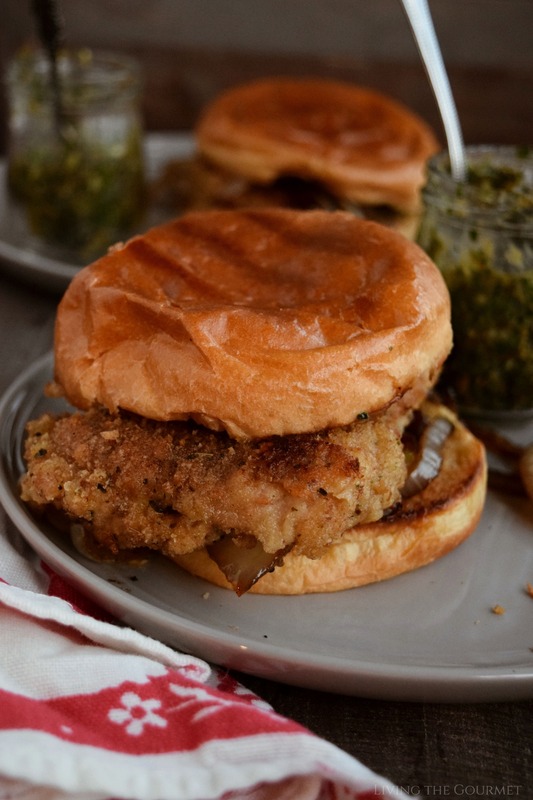 Crisp chicken cutlet and gremolata...such a great combo and the sandwich looks just beyond delicious! 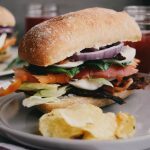 This sandwich looks beyond delicious and a perfect thing to serve for a dinner party. Wow. Thanks for the inspiration. Oh my god, these sandwiches look UNREAL. I was having a craving for breaded chicken yesterday and now I HAVE to have this sandwich. It looks so good! Help me I am drooling everywhere! During my last pregnancy I craved crispy chicken sandwiches my whole first trimester. I don’t think I’ll ever not love them. This oven baked option is a little more forgiving. 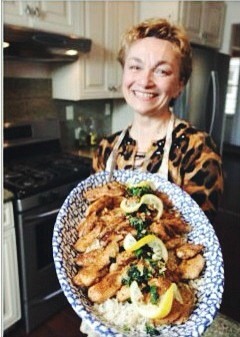 I can wait to try the gremolata on top! These look so good and easy to make too. 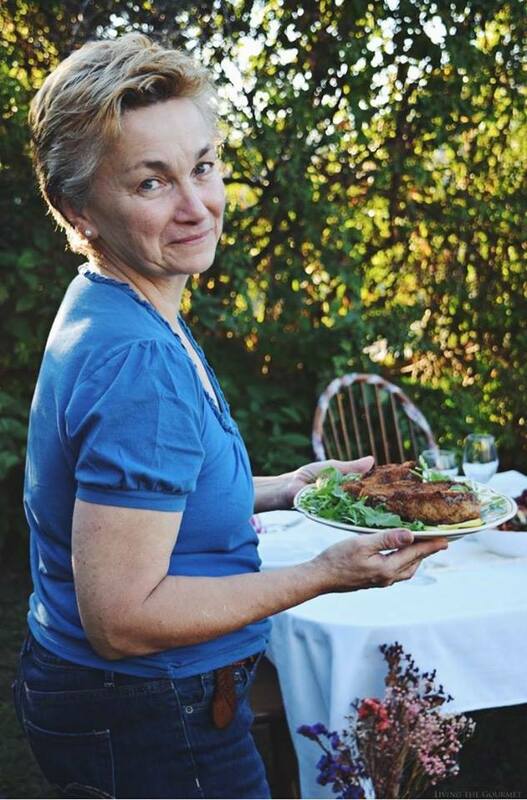 I love that they are not fried either, thanks for sharing! I love burgers but I am not a fan of regular chicken burger patties as they tend to be super dry! This sandwich is right down my alley! The gremolata adds some zing and surely takes these sandwiches to the next level! This sounds like a great lunch or dinner idea. It would be perfect for the whole family to enjoy any night or day of the week. I could eat that gremolata out of the jar! I can't wait to make these for dinner tonight. 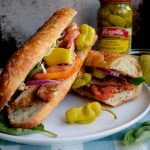 This Italian chicken sandwich looks fantastic! I love the addition of the Gremolata to it. 😍😍😍 I can hear the crunch of these cutlets from the photos. Holy moly. These sandwiches look incredible! Love how simple the breading is! This is guaranteed to spice up my lunch! I'm loving this sandwich idea! I eat the same things over and over! 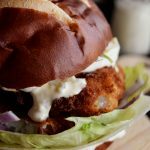 I love a good chicken sandwich and these look absolutely divine! 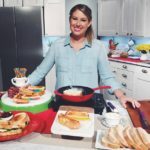 I can't wait to give this recipe a try! Booyah! Everything about this is utterly fantastic! I especially love the sauteed onions on this. Om nom nom. I am so trying this out for dinner tonight on some gluten free buns or just lettuce wraps. The gremolata sounds amazing. I have never had it, but I have all the ingredients in my fridge, totally going to give it a try. Ill let ya know how it goes. This sounds right up my street! Will defo have to give this an idea for our next date night! This looks incredible! I've never tried gremolata but would love to try this out at home. Great recipe. omg this italian sandwich look sooo delicious. I can't wait to make it, thanks a lot. I've never had Gremolata before. It sounds like it'd be delicious. 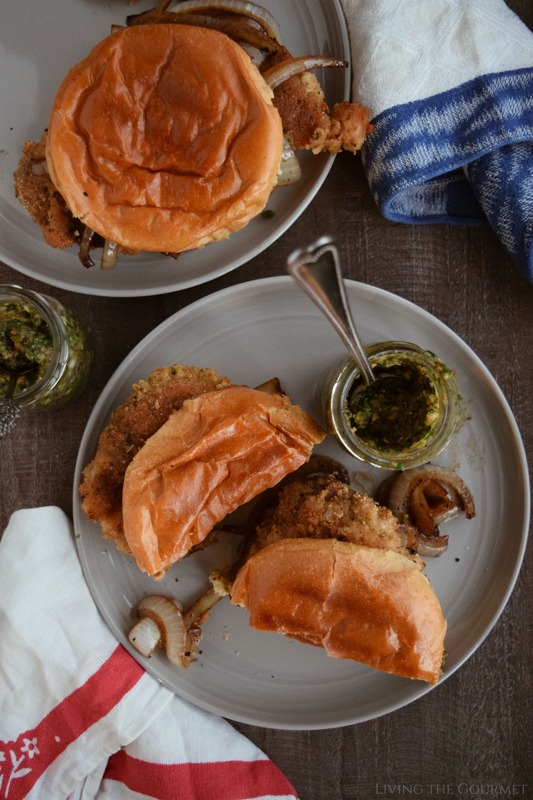 I'll have to make these chicken cutlet sandwiches with Gremolata one day soon. Thanks for sharing the recipe! This looks absolutely incredible. My mouth is watering! This would make a great lunch or snacks for a picnic. We have a picnic this coming weekend so I guess this would be a good recipe and snacks to bring out. Now these look like my kind of sandwich! What a delicious lunch option, I'm definitely considering making this for my lunch this weekend! I am surprise to see such a crisp chicken in the oven. Definitely a must try. Wow, this looks so nice and delicious! I can't wait to prepare this! My husband would love this sandwich! I should surprise him and make it one day. I prefer chicken thighs over chicken breasts; it's a great cut of meat! This looks delicious! This looks so delicious; I personally prefer a toasted bun, but this is so delicious that I could go either way! Oh my goodness. This looks so tasty. I would love to try this recipe. 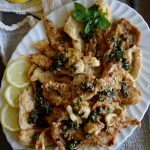 Anything with chicken is really good for my family and this recipe of yours will really put a good smile on their face. It look so delicious and easy to make. I’m always looking for new recipes and this one sounds so good! I need to make this for dinner! I could totally do with one of these sandwiches right now. They look absolutely delicious!